Recommend a friend today! to Just Tyres & Claim £10 of love to shop vouchers, plus a chance to WIN a further £50 of High Street Vouchers in our prize draw*. If you have a friend that needs tyres for their vehicle, why not recommend Just Tyres? Not only will your friend be delighted with the exceptional service and value they receive from Just Tyres, you'll also receive £10 worth of voucher for every friend you recommend who goes on to make a purchase. What's more, you'll be entered into our prize draw** with the chance to WIN a further £50 worth of High Street Vouchers. Here's how to WIN and claim your vouchers. 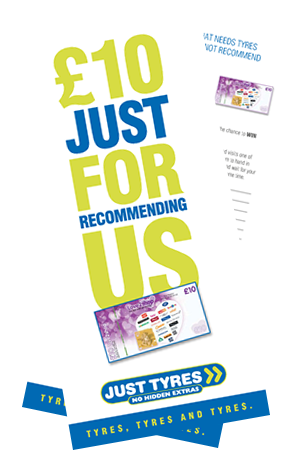 When your friend visits one of the Just Tyres Centres and makes a tyre purchase, simply tell them to hand in the completed leaflet to the Centre Manager, then, just sit back and wait for your £10 voucher to arrive. You'll also be entered into the prize draw at the same time. **Prize draws are held at least every three months. ***The person recommendings invoice date should be no older than 6 months from date of issue.